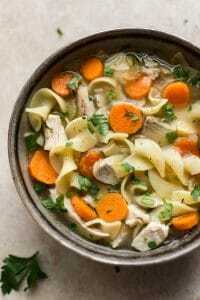 This turkey noodle soup recipe is fast, delicious, and the perfect way to enjoy roast turkey leftovers from Thanksgiving! Happy Thanksgiving to my American readers! As a Canadian, we had ours back in October, but as a food blogger with a primarily American audience, it certainly feels like I celebrate it more than once haha. If you’re looking for other turkey leftover recipes, check out my creamy leftover turkey soup, my Thai turkey soup, or my leftover turkey pasta. 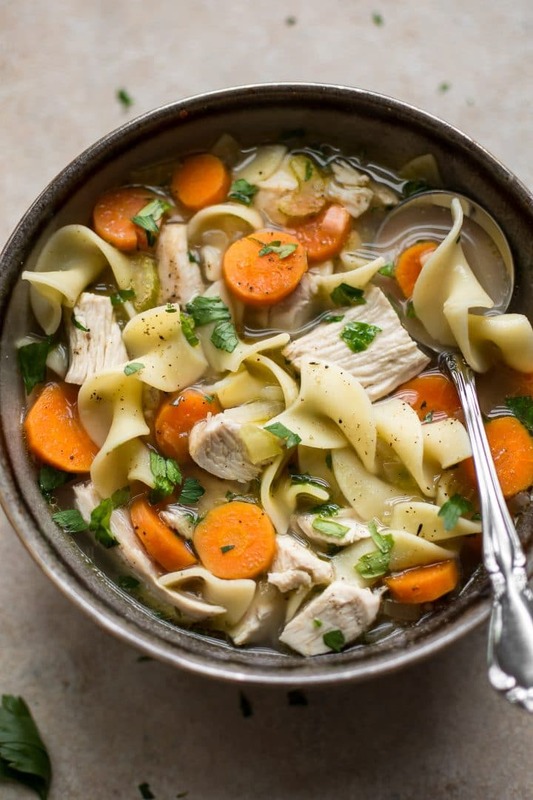 This turkey noodle soup is made without the turkey carcass – I just used shredded turkey meat. Carrots, celery, onions, garlic, and a bit of fresh parsley give this soup that familiar, comforting flavor. 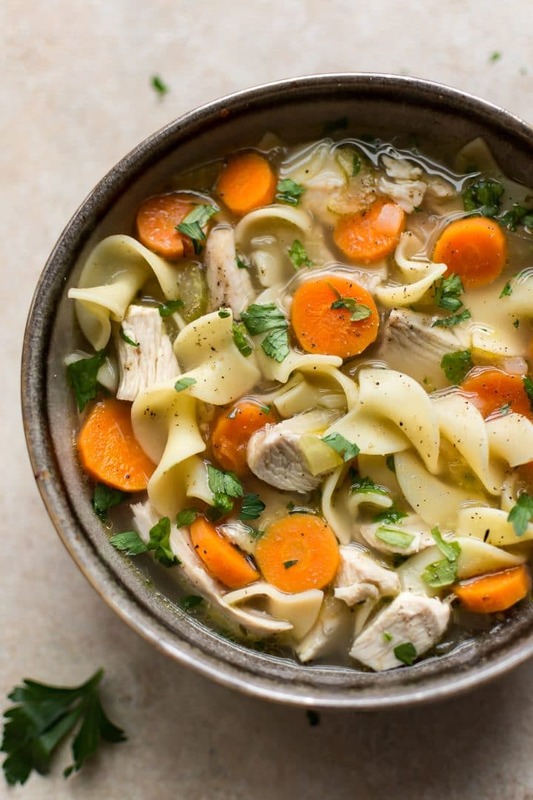 It’s like the classic chicken noodle soup we all love, except with turkey. I think egg noodles are the best noodles for turkey noodle soup, but you could always use something different (e.g. whatever pasta you have on-hand) if you prefer. You could add a splash of cream to this soup, but I didn’t find it necessary. Got leftover chicken? You could definitely use that instead if you wish. 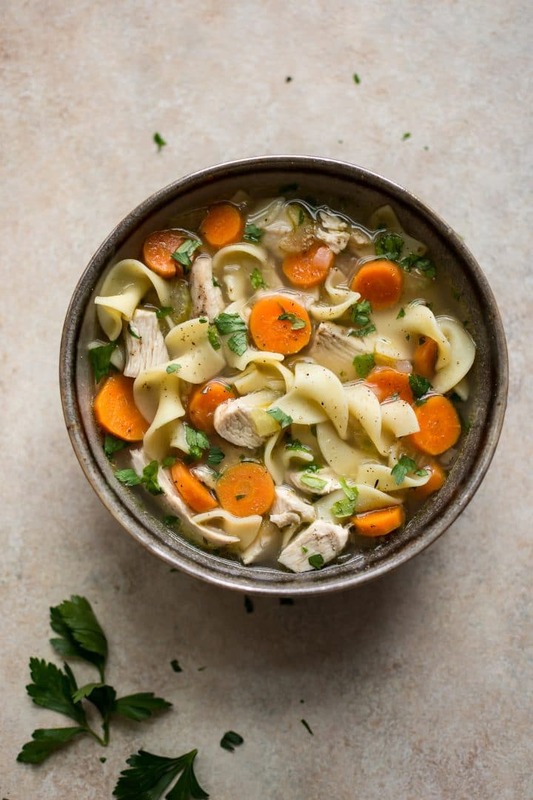 Let me know if you’ll make this leftover turkey noodle soup! Questions? Leave me a comment below. 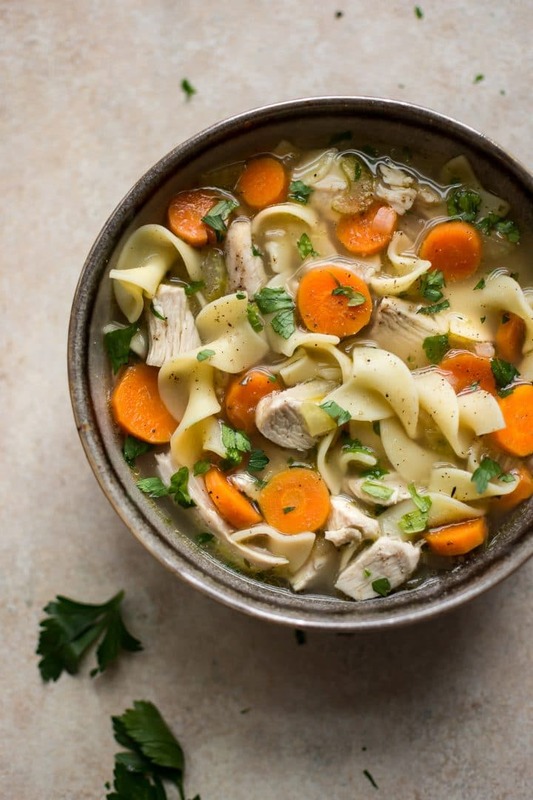 This turkey noodle soup is fast, delicious, and the perfect way to enjoy roast turkey leftovers from Thanksgiving! Melt the butter in a large soup pot over medium-high heat. Add the onion and celery and sauté for 5-7 minutes. Add the garlic to the pot and cook for about 30 seconds. Add the broth, water, turkey, Italian seasoning, and carrots to the pot. Increase the heat to high and bring to a boil. Add the egg noodles and reduce the heat so the soup is gently boiling. Cook for about 10 minutes or until the noodles and carrots are done. Stir in the parsley before serving. Season with salt & pepper as needed. If you don't cut the carrots fairly small or you're using larger carrots, I suggest giving them a head start prior to adding in the egg noodles. Perfect way to use those leftovers!! Gotta try!